Hello! 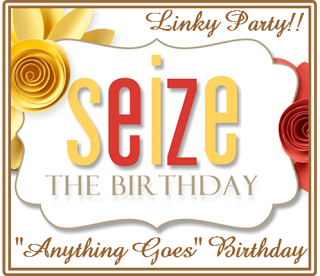 I have been playing again with Gina K stamps sets Old Country Roses and Tiny Textures to create this birthday card. 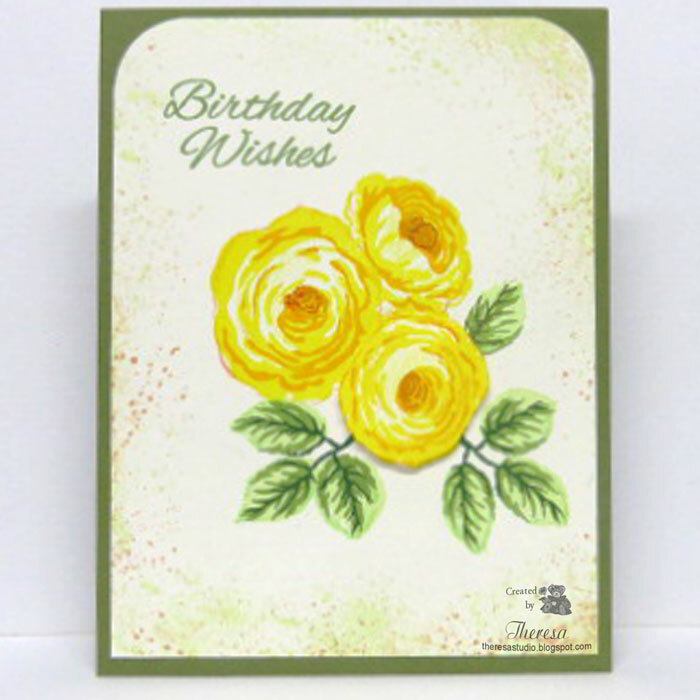 On Ivory CS, I stamped the roses in 3 steps using SU Yolo Yellow, Summer Sun, and So Saffron inks. The leaves were stamped with Memento New Sprout, Bamboo Leaves, and Olive Green inks. I stamped and cut out one of the rose design and popped up on the image for some dimension. 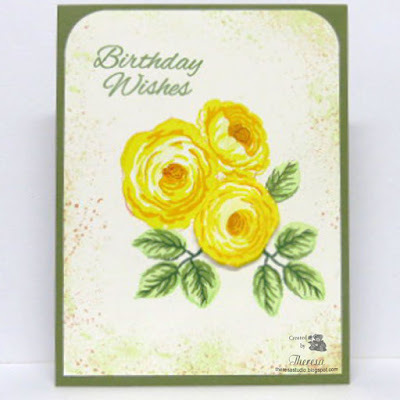 The sentiment stamped in green is from GKD Wild Blossom set. I added some distressing to the background with Distress Inks Honey Mustard and Tea Dye and New Sprout. Card Base id GKD Fresh Asparagus CS. Also used corner punch. Alphabet Challenge: I is for Ink It Up. 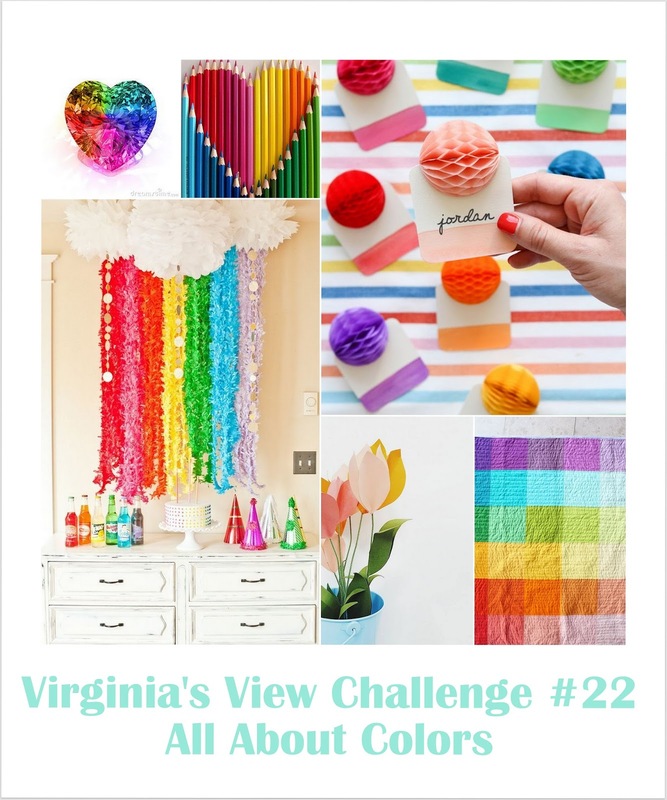 Virginia's View Challenge: #22 Summer Challenge All About Colors. 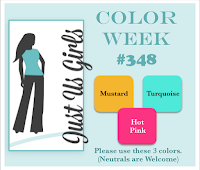 I used multi stamps and colors for color layering. As promised, I am back with more cards made using sketch from CAS(E) this Sketch #178. 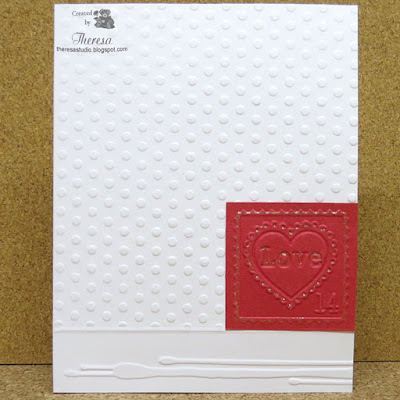 The above card has no ink stamping (only an embossed postage stamp) on the front (message will be inside) but a lot of Dry Embossing with Cuttlebug EF's Polka Dots, Pop Culture Border, and Love Postage Stamp ( red CS). I trimmed the embossed postage stamp and added it to the White Card Base with some scoring beneath the dots. Also added some glitter to the postage stamp. On the second card I simply embossed the Love Postage Stamp EF on a Pink Shimmer CS and added some Wink of Stella for more shimmer. EF from Cuttlebug. Hello! 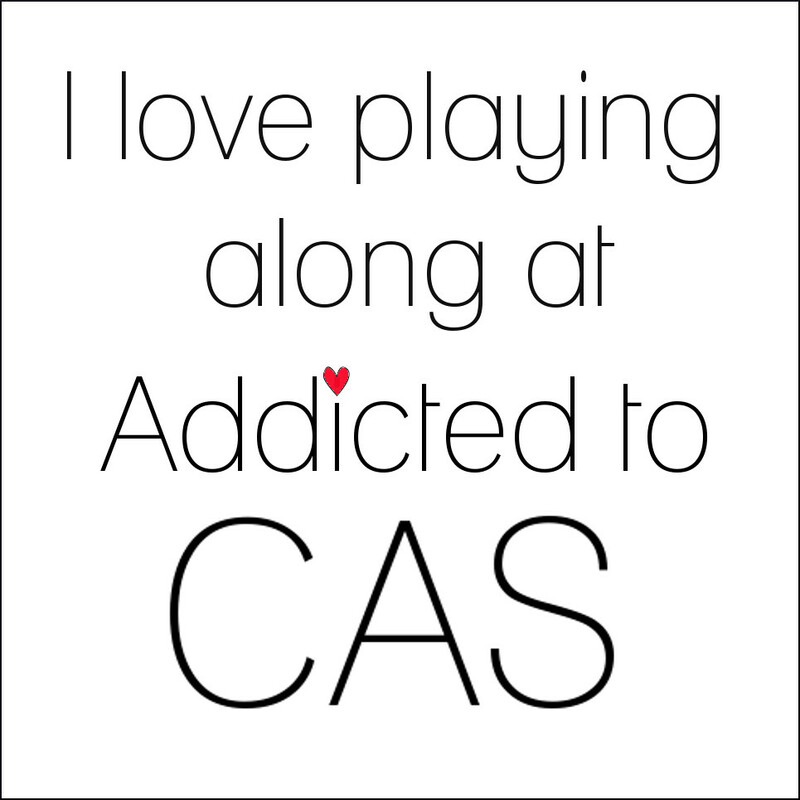 I have been playing with the CAS sketch shown below....I had several ideas and will be sharing a few cards that I made. This one was made as a one layer card with White CS. I stamped a square burlap-like stamp from GKD Tiny Textures in Memento green ink and a sentiment from Paper and Such. 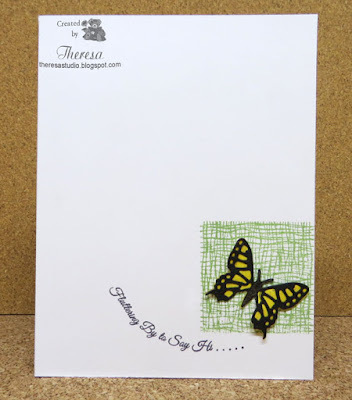 I die cut a butterfly in black CS and the Wings in Yellow CS and simply attached to the green square. The yellow wings were covered in shine with Clear Star Pen. 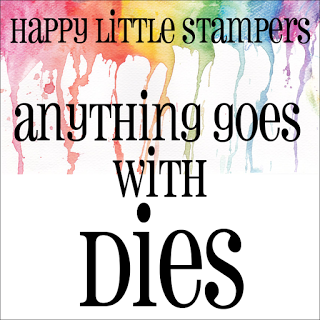 Dies are from Cheery Lynn. 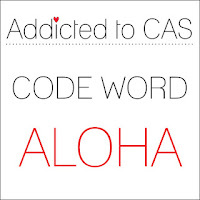 CAS(E) this Sketch: #178. There are so many possibilities with this sketch. 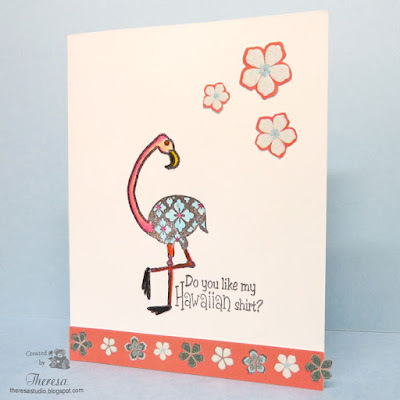 Addicted to Stamps: Challenge #129 is Anything Summer. Welcome! 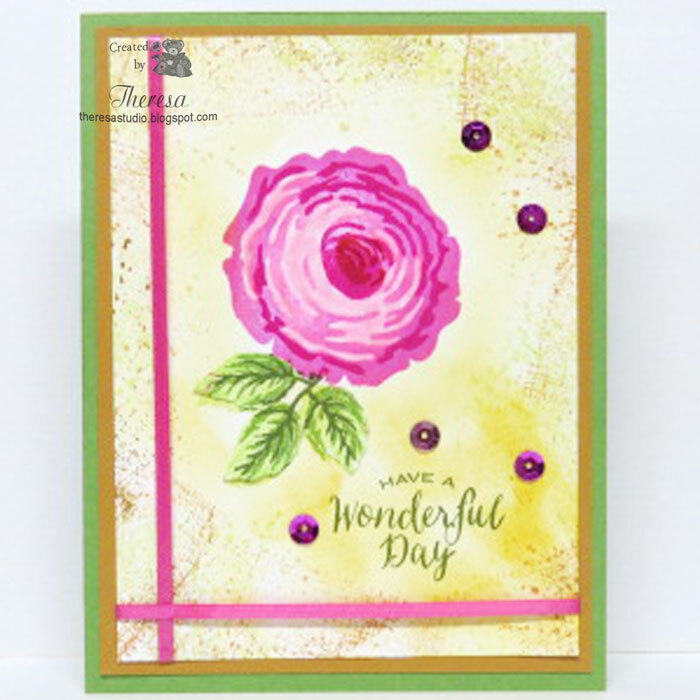 Today my card features Gina K Stamps from Old Country Roses and Tiny Textures. I stamped the 3 step Rose design with SU Pixie Pink, Pink Passion, and Ruby Red on white CS. I seldom use any SU inks ( and I have a bunch) but they were perfect for the rose. I then added the leaves from the same set and did the 3 step stamping with Memento New Sprout, Bamboo Leaves, and Olive Green inks. I added some distressing using fun stamps from the Tiny Textures set with Distress Inks Tea Dye and Wild Honey. I used GKD CS's for the base and mat. To really dress up my card, I added Pink Satin Ribbon and some sequins from stash. The sentiment that I chose from Country Roses is appropriate for many events or just for a card to send someone for the fun of it. Allsorts Challenge Blog: Week 369 Photo Inspiration. The colors from this photo worked beautifully for my card. And the country roses also were inspiring. 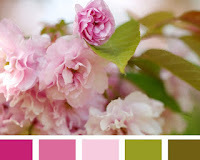 Fussy and Fancy Friday Challenge: #166 Say it with Flowers. 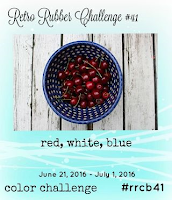 The Ribbon Girl Blog: June Challenge is any image ...use ribbon. 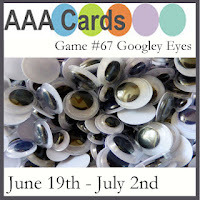 613 Avenue Create Challenge: #182 Anything goes with optional twist the sights, tastes, and sounds of summer. Used the sight of flowers. 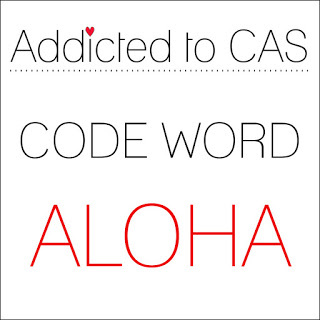 Lately I have been making so many CAS cards or quick and easy ones, that I enjoyed making this creative one with a lot of stamping, lots of inks, and adding some pretty embellies. Hope you enjoy! Hello! 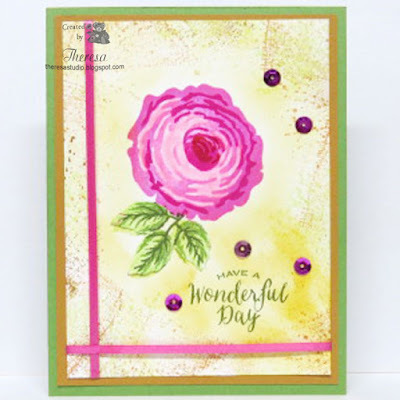 This card was a result of playing with some new stamps from Gina K Designs.....Tiny Treasures and Birds & Blooms(sentiment). 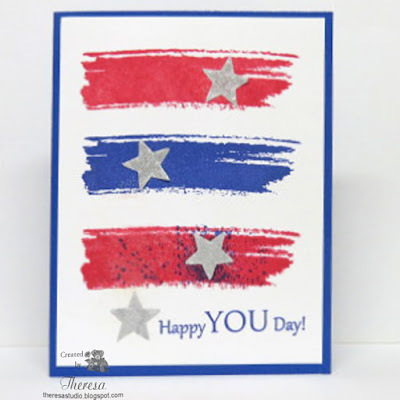 I splashed red and blue streaks on to a white CS and then made some splatter spots with Blue ink. Used Memento red and blue inks with card base of SU Brilliant Blue CS. Added some silver stars found in my stash of cut outs. Love the Tiny Treasure stamps which I know I will be using often. 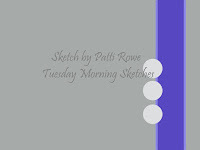 I made this for a Mix It Up Monday challenge at Stamp TV STV16MON20. Hello! This year seems to be going so quickly. It soon will be time for the Hall Of Fame's Balloon Classic in Canton, OH and we may again see the balloons flying by our house. 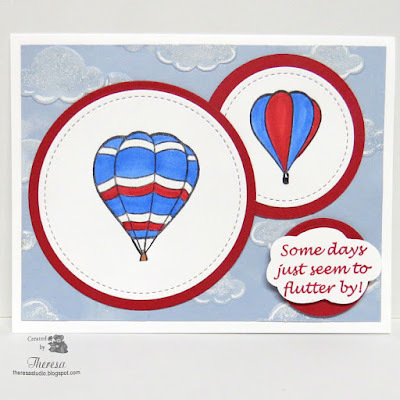 With that in mind, I thought it was appropriate to make this card for the sketch challenge at The House That Stamps Built using Repeat Impressions Hot Air Balloon stamps with one of their sentiment stamps ( one of my faves for cards with flying images). I made the background by embossing Blue CS with Clouds EF .....I tried to heat emboss clouds with White Puff EP but that did not turn out like I wanted. So. I just added white accents with a white pen. Balloons were stamped with Memento Tuxedo Black ink and colored with Copics. I cut them with Lawn Fawn Stitched Circles dies and added Red Circles cut with Spellbinders Circle dies. The cloud for the sentiment was cut free hand and popped up on another Circle of Red. 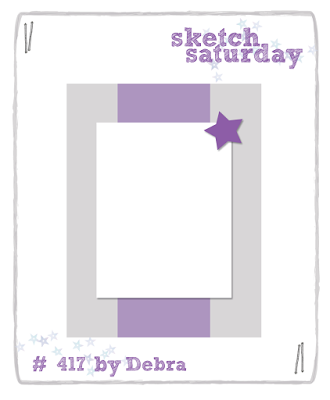 All was arranged on a White Card Base according to the sketch below. 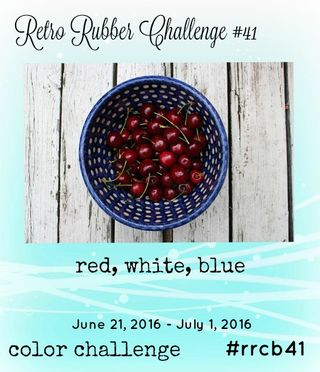 Retro Rubber Challenge: #41 Color Challenge Red, White and Blue. I have had these balloon stamps since May 2014. I can trace the date from older posts on my blog. 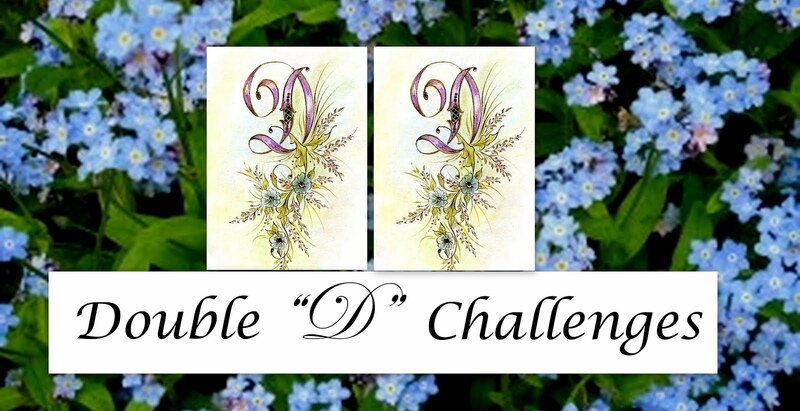 As You Like It Challenge: Favorite Die and Why. I think the circle dies are my favorite because they were my very first to own and I used them more than any ones that I have. They may be plain but great to have AROUND. 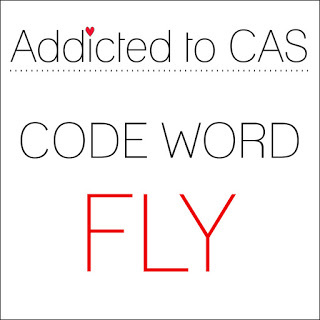 Addicted to CAS: Challenge #91 Code word is FLY. 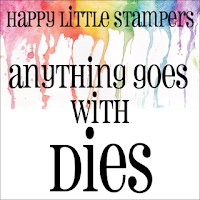 Happy Little Stampers: Anything goes with dies. Welcome! What is better on a HOT day than a dish of COLD ice cream? I am serving up some with From The Heart digital stamps Ice Cream Lineup and their Sketch Challenge 157 using their twist: Make it Sparkle. 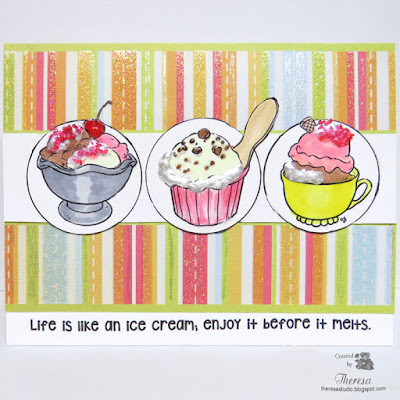 I printed the servings of ice cream on white CS and colored with Copics and added some Stickles and Liquid Pearls plus a sprinkling of Sugar Sprinkles(Wilton). Also used a bit of Glossy Accents. I drew circles around each with Black Pen after trimming out the images. I used some old striped Glitter Paper by DCWV (from stash) for the background and finished with a sentiment from the same digital set. 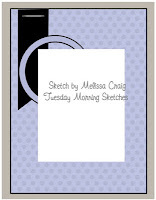 As you can see I rotated the sketch to make a horizontal card. 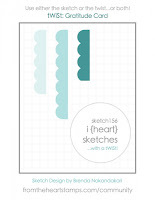 From The Heart: I (heart) Sketches # 157. I used both the sketch and the twist. 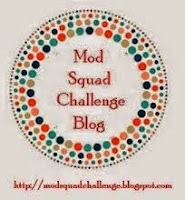 Mod Squad Challenge: All That Glitters. Glitter on the stripes as well on the images. Simon Wednesday Challenge: Simon says add some shimmer. Lot of shimmer in the ice cream toppings. Addicted to Stamps: Challenge #129 Anything Summer. Used digital stamps that I colored with Copics. Hello! Today I have been playing with shine and glitter on a Wedding card. It is sooo hard to show the results in a photo so I have shared 2 photos of the card so that hopefully you will see the shine achieved with Sakura Stardust and Wink of Stella Pens. More shine and shimmer is included in the Gold Shimmer CS by DCWV and the Metallic Gold Bells cut with the Cameo. I was inspired by several challenges in the making of this card using a Digi Image from A Day for Daisies. The digi was printed on GKD heavyweight CS. A Day for Daisies: Challenge #150 Add Glitter. 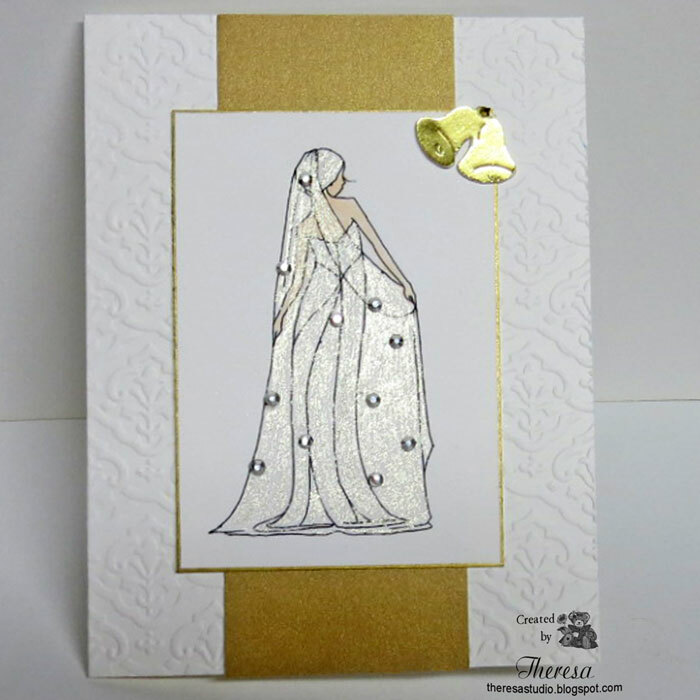 Used glitter pens and rhinestones as well as the shimmer and metallic CS with Wedding Veil digi. Cards in Envy: It's a great day for a White Wedding or Anniversary Card. Card is flat enough for a A2 envelope. Shopping Our Stash: #257 Use a Dress or Dress Form. 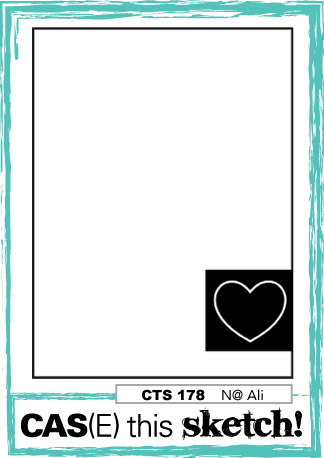 Use a ADFD Digital image from my stash of images and also the bell file from my Silhouette files. Also used rhinestones and CS from my stash. 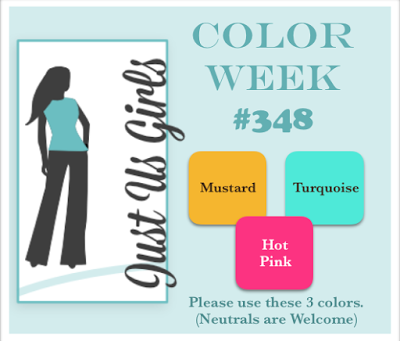 Mod Squad Challenge: All That Glitters. 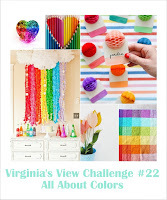 Missed last week's Wedded Bliss challenge but used that theme with my glitter this week. Lot of glitter on the wedding dress. Simon Wednesday Challenge: Simon says Add some Shimmer. And my card shimmers in the cardstock and on the dress. Note: I have a new Epson printer because my HP printer quit feeding heavier paper and struggles to print even after I cleaned the rollers and other maintenance. For my birthday, I asked for Epson SureColor P400 which I can say is a dream printer for a crafter. 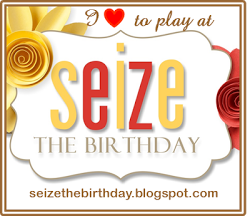 And my DH made my birthday wish come true. Hello! I love my coffee in the morning. I begin each day with my DH making and serving me coffee.....thus my card reads "Your love sustains me" an older stamp from GKD Life is Good set on my card. The Coffee Cup stamp is from GKD Signs of Autumn. I colored the cup with Pencils and OMG. 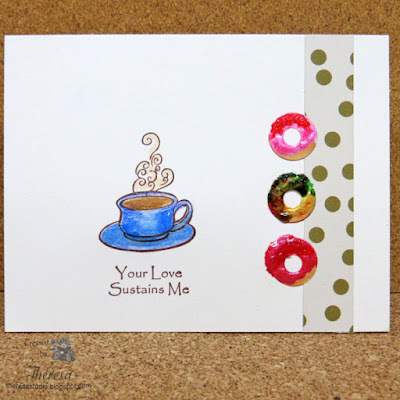 Since I wanted to add some Doughnuts and do not have a Doughnut stamp, I simply cut mine with circle dies and colored with Copics and Stickles and then sprinkled with Wilton Sugar Stickles. 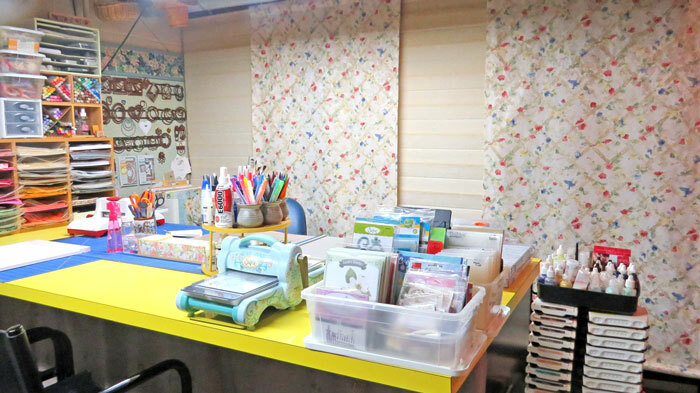 Other Supplies: GKD Ivory CS, MME Pattern Paper, SU Close to Cocoa ink, Glossy Accents. 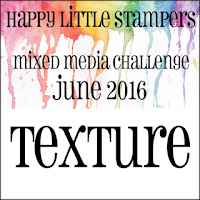 Stamp TV: Mix It Up Monday Challenge Coffee, Tea, Sweets, O My! 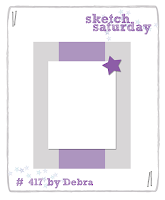 Tuesday Morning Sketches: # 357 Sketch. This was a great layout for Coffee and Doughnuts. Hello! I have been playing with some google eyes and a Origami dog that I printed from this website http://www.heatherlynneshida.com/origami/PRINTABLES/choosedog.html . 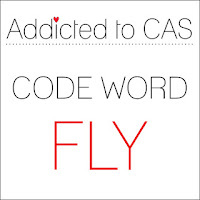 The dog made a quick focus for my CAS card. 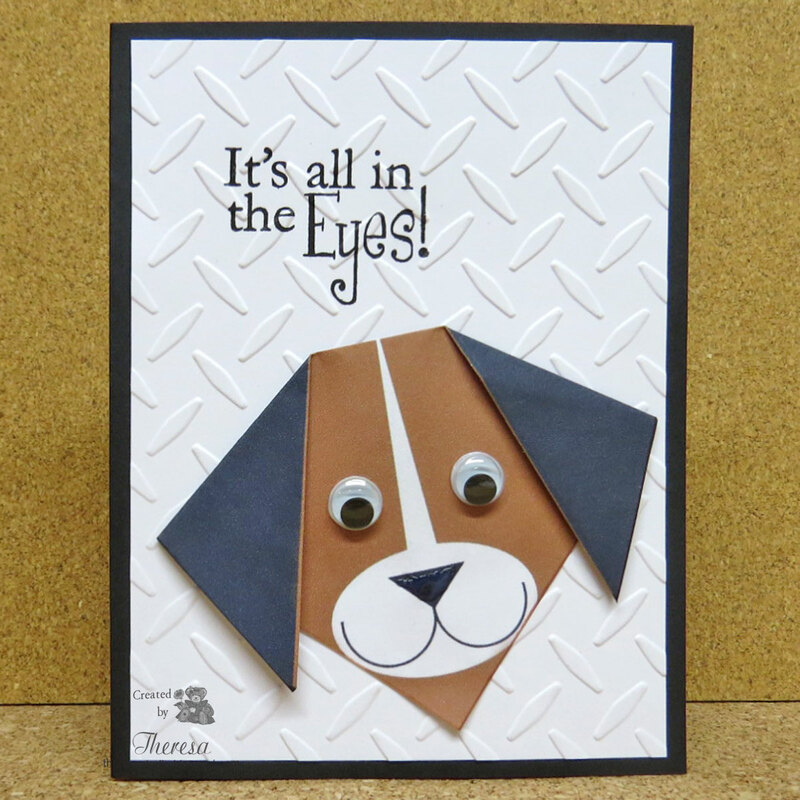 I will be using this dog again but may use cardstocks to cut the design. For the card, I used a Black card base and a layer of White that I embossed with EF Diamond Plate. The MFP stamp was inked with Versafine Onyx Black. Finished with the google eyes and a bit of Glossy Accents on the nose. I made this card for a color challenge as well as a sketch challenge. I used some new stamps from Gina K .....treated myself for my birthday....my DH always has some funds in Paypal for my stamping supplies. Isn't he the best? The Ribbon Girl Challenge: June challenge-use any image. Hello! Today I have something a bit different for a Photo Inspiration challenge.....I used one of my own photos instead of a stamped image. I think that is allowed?? maybe?? And I did do stamping for the sentiment. When I saw the inspiration from What If? 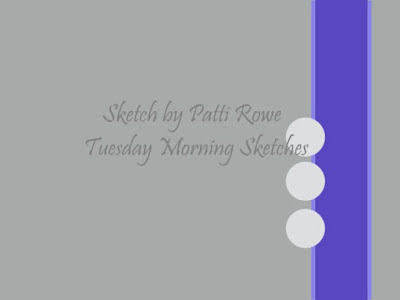 Wednesday challenge, I thought of a photo that I had made and tweaked in Photoshop to give it a look of watercolor. I thought Why Not? Use it. I cropped, resized, and printed the image on White CS. After trimming I assembled the card with a Black card base, a layer of woodgrain patterned paper from MME embossed with a Darice Wood Grain EF, and a strip of Black CS stamped with a Repeat Impressions sentiment. That was stamped with Versamark and heat embossed with White EP. 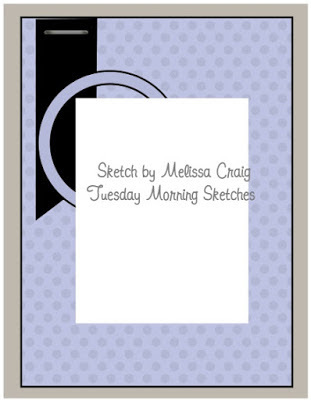 I used a layout from Tuesday Morning Sketch(below) from last week's challenge shown below. Too late for that challenge but I thought the sketch was just right to use with the photo. The House That Stamps Built: What If? Wednesday Photo Inspiration J1516. 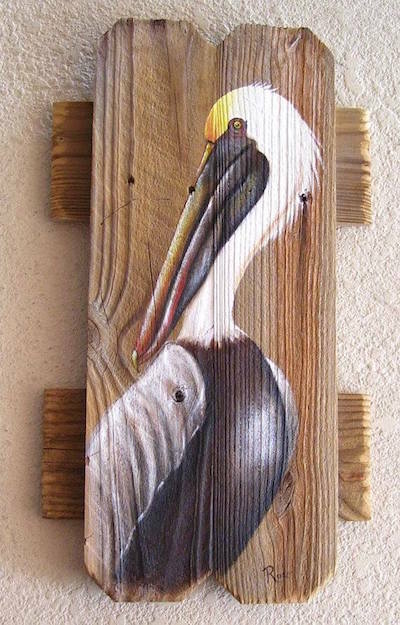 Inspired by the Pelican and Wood. 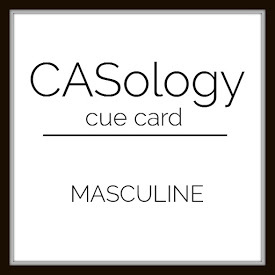 Time Out Challenges: Masculine with optional twist of Mixed Media. 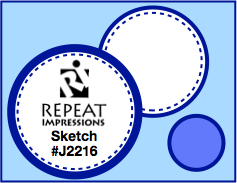 Use stamps and ink plus 2 other elements that add texture and/or dimension. 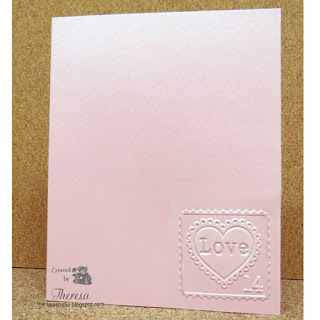 I did use stamping with Versamark, die cuts for dimension, and dry embossing for texture. I think the use of a photo qualifies as Mixed Media. 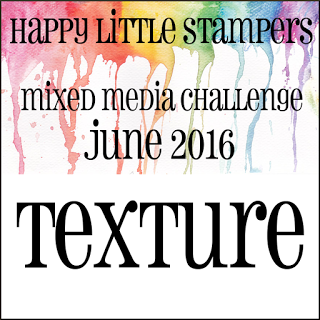 Happy Little Stampers: June Mixed Media Challenge Texture. I have added texture with dry embossing of the pattern background and heat embossing of the sentiment. Hello! Are you enjoying the warm weather? How about some ice cream? 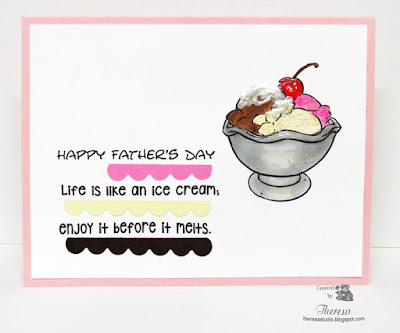 That is what I am sharing today for Father's Day on my card for From the Heart challenges. I have use their digital stamp and sentiment from this month's free stamp Ice Cream Lineup. Please check here for details on their free monthly stamps. After printing the digis on white CS, I colored with Copics and added Glossy Accents and Stickles for shine and texture. 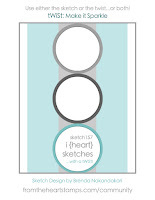 I used From the Heart's I (heart) Sketch #156(below) for my layout but gave it a turn. Happy Father's Day was printed on computer. 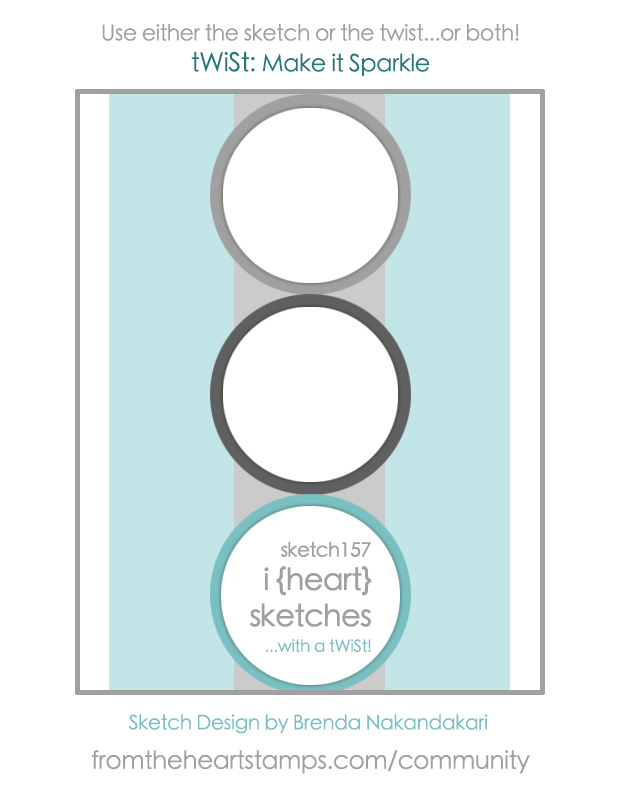 I (heart) Sketches #156: I only used the sketch not the twist. 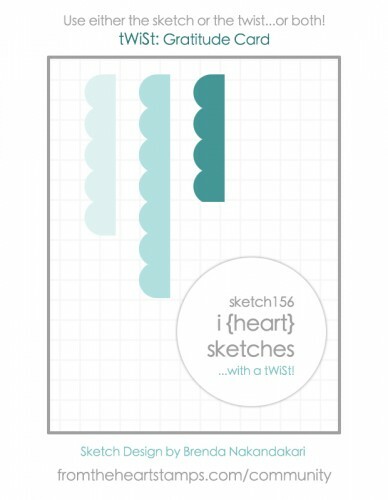 From The Heart: Digital Stamp of the month challenge. Hello! Just playing with some old stamps and glitter pattern paper and came up with a "just for fun" card. 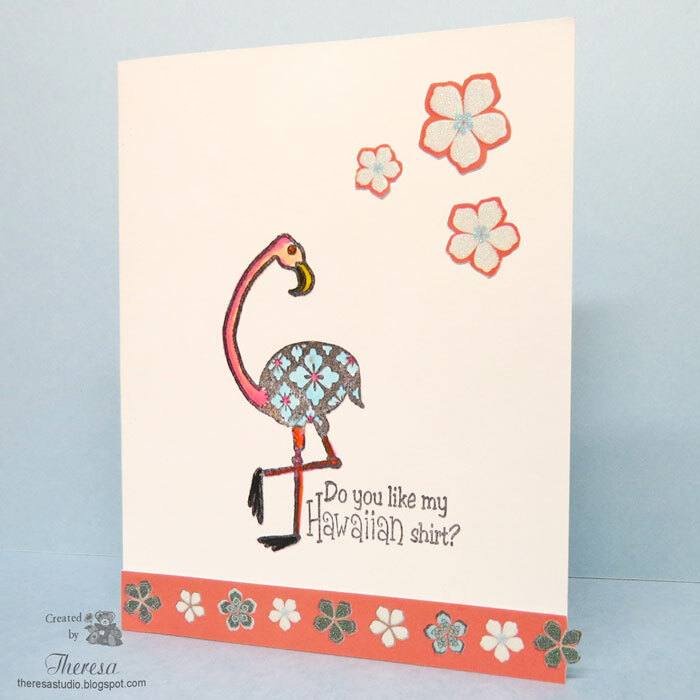 The Flamingo and Sentiment are from Mark's Finest Papers set Flamingo on Vacation and stamped with Memento Tuxedo Black ink and colored with Copics and Glaze pens. Added a strip of glitter paper from DCWV Tahiti Beach Stock and some fussy cut glittery flowers from the same pattern paper to the one layer card. I also added some glitter with a Stardust Pen to the shirt. 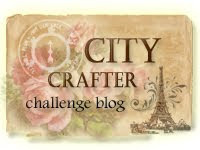 Creative Corner Challenges: Theme is Glittermania. Glitter on flowers and shirt. 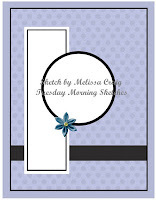 Crafty Sentiments Designs: Theme is Summer....used summer colors. Hello! Today I have a shaker card to share....not one of my favorite type of cards because I always have a difficult time photographing to show the items in the shaker window. But they are still fun to make. I made this one for the Mix It Up Monday challenge Shake, Shake, Shake at Stamp TV. Since I am on a quest to use products and stamps that I seldom use or never used, I began by selecting what I would use in the shaker from some old stash of confetti. When I found these musical notes, I decided to go with a musical theme. 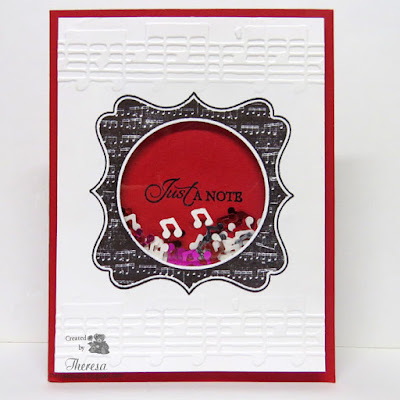 I found this GKD Label stamp in the Lovely Labels 2 set as well as the sentiment to go with my theme and also pulled out Cuttlebug EF Allegro to create my card with Red and White CS, GKD Black Onyx ink, circle dies, a circle of acetate and a foam sheet. The result is shown above. For this shaker, instead of using foam tape I used a panel of white foam cut slightly smaller than the white panel and cut out a circle for the window. 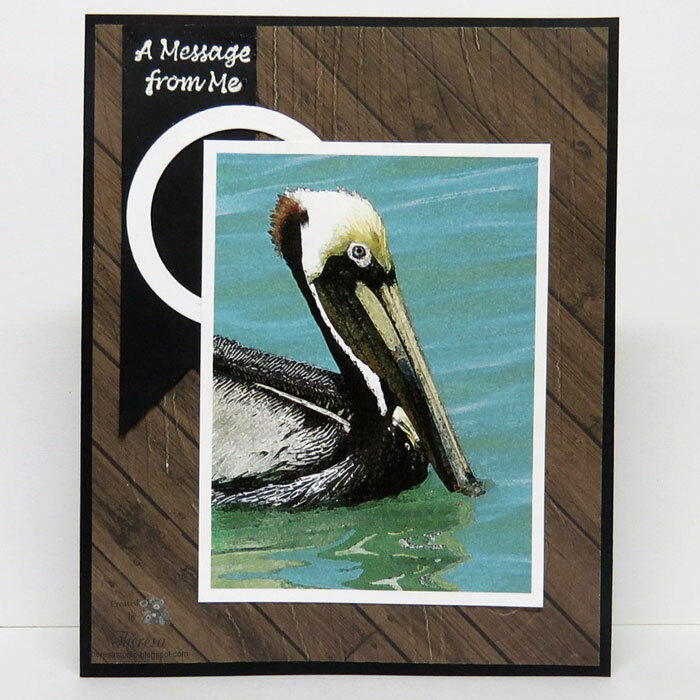 The foam was taped between the card base and top layer. I used a die machine to cut the circle from the foam but next time I think I will cut by hand as the foam was flatten a bit by the machine. Hello! I have been playing with an old LOTV stamp with James Bear Deckchair Dreaming which I know I have had since 2010 or earlier. 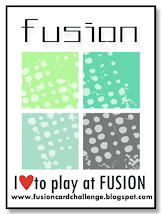 I stamped the image and colored with Copics and die cut with Nesties circle die and then added to a design made with Bazzill Grapefruit Bliss CS and pattern papers from MME Collectable pad. I used the sketch from Retro Rubber Challenge #40. I finished with a Father's Day sentiment from GKD stamped with Versamark and heat embossed with Red EP. 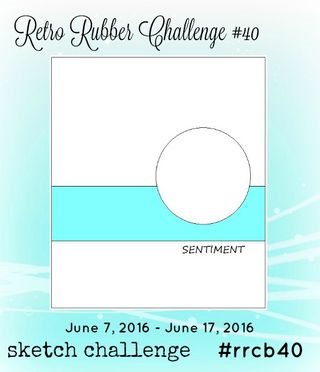 Retro Rubber Challenge: #rrcb 40 Kind of Sketchy challenge. Used stamp at least 6 years old. Die Cuttin Divas: Challenge #70 Father's Day. Used Circle dies. Crafty Sentiments Designs: Challenge is Summer. Used a summer image for a summer holiday. 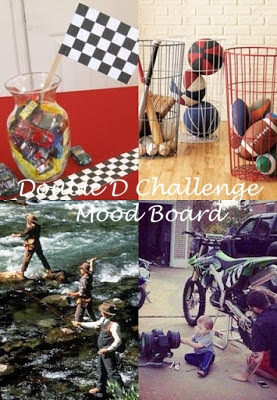 Crazy 4 Challenges: Make it Masculine. 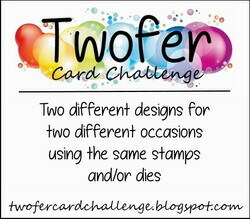 Addicted to Stamps and More: Challenge 198 Holiday. Cards in Envy: No girls allowed. Card is flat enough for an A2 envelope. 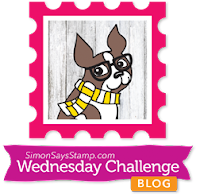 Simon Wednesday Challenge: Simon says Animal Magic. Here's a link to a card that I made with this LOTV stamp in 2010.